December 14, 2015 | -by: Kevin George. SPAM…this four letter word can give any email marketer high blood pressure and headaches. Though, no email marketer considers himself as a spammer and follows the best practices for attaining deliverability. But, the number of undelivered emails is still high and increasing frequently, as a recently done study stated that 22% of permission based emails never make it to the inbox. The same study also stated that last year the spam rate was 18%. 2015 was very fortunate for email marketers, but still the spamming rate grew up to 5% more. When several major ISP’s like Yahoo, Google, Hotmail, etc. are discovering new elucidations to prevent spamming, other entities on the other hand are trying to construct a better mousetrap. 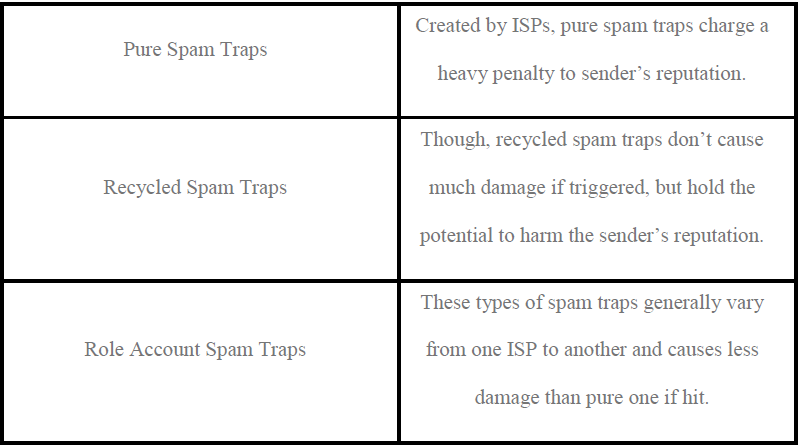 However, there are various spam traps present, but they fall into 3 major categories. Because your ISP is aware of the abandoned email addresses, the sent emails are most likely to be sprung and thus, it will be declared as spam. However, if you are trapped in a spam trap, then the consequences will also vary depending on the type of spam trap and the frequency of sending. Always remember that the sending frequency matters, so if you’re sending an email for 3-4 months, that will massively sabotage the sender’s reputation. How to recover from these spam traps? Creating a list of those subscribers’ who didn’t respond in the last three months would be beneficial. Prepare a re-engagement email campaign for these subscribers with an offer like Free Delivery or 50% Off. Bid your subscribers farewell if you still don’t hear from them. Malformed addresses or inaccurate addresses bog down the sends and increase your chances of getting caught in a spam trap. A better way to remove these malformed addresses is to send your subscribers a welcome email. Scope out the addresses if they bounce. The usage of both multiple captchas and double-optins can help you in keeping fake addresses at bay. Multiple captchas can be used throughout the sign-up procedure to declare if the address is provided by a real user. To attain a list of more active subscribers, use multiple captchas with double-optins as this effectual procedure can help you in gaining active and legitimate email addresses. As basic as it sounds unsubscription link is quintessential, because when your subscriber sees an irrelevant email he/she eventually seek the escape button and when they don’t find it they send it to the spam folder. To know more about unsubcriptions, visit our creative unsubscribe best practices infographic. It’s quite alright to use spam triggered words such as “Free” which used to be a taboo word. As ISPs depend on authentication and spam determiners, subject lines hold no relevancy for spam determiners. However, some tests like using short subject lines, creative and different subject lines, subject lines with emoji, can help you to come up with a golden subject line that can work wonders for you. Today, many ESPs offer built-in spam checker tool to help predicting the deliverability. However, those provided scores aren’t completely reliable but will help you in providing a rough idea to work on the weak areas for improved deliverability. Keep your IP address clean by running a free blacklist checker tool for your IP address. Keep an eye on your sending score. Clean your subscribers list from time to time. Create a procedure to handle soft bounces.